Georgia Spiropoulos composes purely acoustic music, instrumental or vocal, but also electro-acoustic and mixed music where music technology is involved. She also creates video and sound installations. 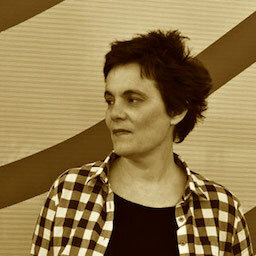 Her work is characterized by a composition "inside the sound" but also by her interest on temporality and form. 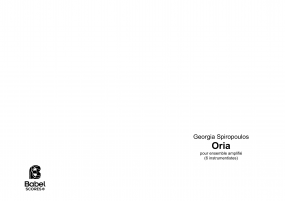 She explores ideas about orality, transmission and perception, and the ubiquity of orality in musical text and performance. This research conducts her to work in proximity with the performer that she qualifies as a "vital encounter" for the creation. 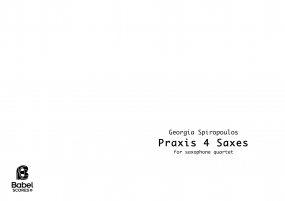 Her thinking on new instrumental and vocal techniques is influenced by the 20th century music and the traditional music, but also by avant-rock, free improvisation, interdisciplinary artists, performance art and turntablism. 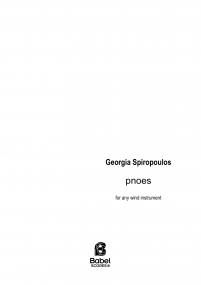 Georgia Spiropoulos (Athens - Greece, 1965) studied classic and jazz piano, harmony, counterpoint and fugue in Athens. 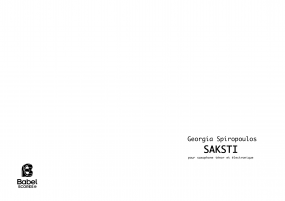 During 10 years she worked as performer, arranger and transcriber of Greek aural/oral-tradition music. In 1996 she moved to Paris to study composition, electro-acoustic & computer music with Philippe Leroux and form analysis with Michael Lévinas. The year 2000-01 she worked at IRCAM Cursus with Jonathan Harvey, Tristan Murail, Brian Ferneyhough, Marco Stroppa, Philippe Hurel and Ivan Fedele. She holds an a M.A from the School for Advanced Studies in the Social Sciences (EHESS) where she worked with Marc Chemillier, Pierre Judet de la Combe and Francis Zimmermann. 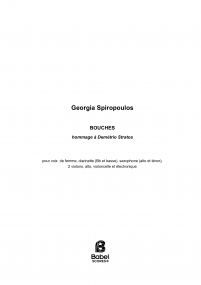 Georgia Spiropoulos is the winner of the "Villa Médicis Hors-les-Murs Award" for the USA and has been working as a composer-in-residence in New York (2003-04). In 2013 she has been made a Knight of the Order of Arts and Letters of the French Republic. 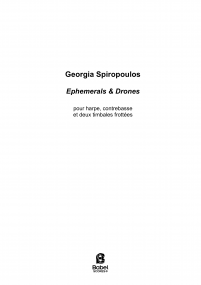 In 2008 Georgia Spiropoulos she worked at IRCAM as a composer in research with the project "Mask: Voice transformations and computer tools for live performance". She has received commissions from IRCAM-Centre Pompidou, the French Ministry of Culture, the Baden-Württemberg Ministry of Culture, "Marseille Cultural Capital of Europe 2013", Radio France, Sacem, Haus der Kulturen der Welt of Berlin, La Muse En Circuit. She collaborates with many ensembles (Ensemble Intercontemporain, Ars Nova, 2E2M, L'Itinéraire, San Francisco Contemporary Music Players, Smashensemble, Aventure, Nikel, Smashensemble, Nikel, Bl!ndman, dissonArt, Aventure, Zafraan, Octopus, Habanera and Prism saxophone quartets), choirs (Accentus, Le Jeune Chœur de Paris, Les Cris de Paris), and soloists such as Claude Delangle, Médéric Collignon, Vincent David, Theophilos Sotiriades. 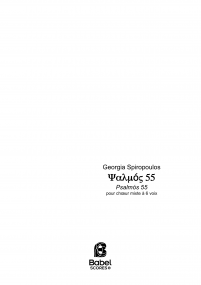 Her works are performed internationally, at festivals such as Agora, Tenso Days, Présences - Radio France, Athens & Epidaurus Festival, In Transit - International Festival of Performing Arts - Berlin, Seamus, Extension, Musiques Libres de Besançon, Gegenwelten Festival Neue Musik, Futura, WhyNote, Aujourd'hui Musiques, Musiques de Notre Temps, Hateiva, Sinkro, ICEM, SMC, WFAE, WOCMAT, Electroacoustic Music Days de Grèce, The Electronic Arts and Music Festival de Miami, Boston Cyberarts Festival. 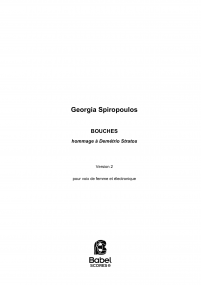 She gave lectures about her work at Columbia University (NYC), University of California Santa Barbara, IRCAM, Hochschule für Musik und Theater München, SMC Conference, Tel Aviv Conservatory, Alte Schmiede-Vienna, French Institut of Athens.